It’s a union that dates to England’s merger with Scotland in 1707 and even before, with the shared monarchy in 1603, when Elizabeth I bequeathed the English monarchy to James VI of Scotland. It’s a union that spawned the 18th century enlightenment movement and the industrial revolution and built the world’s largest colonial empire in the 19th century. Today, the United Kingdom of Great Britain and Northern Ireland has an economy of $2.6 trillion, making it the world’s sixth-largest, it remains the chief ally of the United States, the preeminent global superpower, and it sits as one of five permanent members of the United Nations Security Council. Though Scotland is home to just 8.4% of the total UK population, it constitutes, by area, the northern third of the island of Great Britain. Scotland’s population has always been lower than England’s — in the first UK census of 1801, England had 8.9 million people, Ireland had 5.2 million, and Scotland had just 1.6 million. It wasn’t even until 1911 when Scotland’s population overtook Ireland’s, and that came just 11 years before Ireland became a ‘free state.’ (Arguably, you could say that the Union’s first blow came in 1922 with the loss of Ireland). But there’s a sense that Scotland always punched above its weight within Great Britain. During the Enlightenment, Scotland gave Britain (and the world) Adam Smith, David Hume and Robert Burns who could be credited as the respective fathers of modern economics, philosophy and literature. Scotland contributed more British prime ministers than you might expect, too, including both Tony Blair and Gordon Brown, as well as Sir Alexander Douglas Home, Andrew Bonar-Law and Ramsay MacDonald earlier in the 20th century. Scottish scientist Alexander Fleming discovered penicillin, James Watt invented the steam engine and Alexander Graham Bell invented the telephone. Andrew Carnegie, who left Scotland for the United States, would become a leading steel magnate and industrialist, and Sir John MacDonald would become the first prime minister of Canada. Cameron has claimed for months that he wouldn’t resign in the event of a ‘Yes’ victory, but it was virtually an academic question until now. Not a single poll — until last weekend — showed that the ‘Yes’ campaign would win the vote. But though Tory political fortunes in Scotland have flagged for decades, it’s Conservative rank-and-file who might be most angry at losing the referendum, because of the national humiliation they believe it (and Cameron) will cause. Scottish voters, who tilt mildly more to the left than English voters, turned against the Tories in the 1980s when they bitterly opposed Conservative prime minister Margaret Thatcher’s free-market vision of Great Britain — and it didn’t help that she chose to roll out the unpopular poll tax first in Scotland. In the 2011 Scottish election, the Tories placed far behind in third place — the Scottish National Party (SNP) won 69 seats, Labour won 37 and the Tories just 15, with the Liberal Democrats and the Scottish Green Party winning the handful of remaining seats. In the most recent 2010 general election, the Conservatives won just one seat (out of 59) in Scotland on the strength of 19.9% of the vote (Labour won 41 seats, the Lib Dems 11 and the SNP six). That’s one of the reasons why Labour — and not the Tory-Lib Dem government — is taking the most visible role in leading the ‘No’ campaign, ‘Better Together.’ When Salmond last month participated in two debates bout Scottish independence, he faced off against former Labour chancellor Alistair Darling, not Cameron. Even former Labour prime minister Gordon Brown, hardly the most popular figure, has taken a more high-profile role than Cameron within the ‘Yes’ campaign. Ironically, if the ‘Better Together’ campaign has been a failure, it’s due more to the strategic errors of Labour figures like Darling and Labour leader Ed Miliband, not necessarily Cameron, who didn’t want the referendum to turn into a plebiscite on his own popularity in Scotland. It was a Labour government that set Scotland on the path to potential independence in 1997 when it paved the way for devolution, restoring to Scotland the right to have a parliament after centuries of Westminster-based rule, and it was a well-respected Labour figure, Donald Dewar, who served as Scotland’s initial first minister. (Curiously, Johann Lamont, the leader of the Scottish Labour Party, has played a subdued role for the ‘No’ campaign). Rebel Tories are already promising that the prime minister would face strong calls to step down if Scotland votes for independence. Even if he survives those early calls and remains in No. 10, Cameron almost certainly couldn’t turn around and lead his party into the May 2015 general election. Given the role of his chancellor, George Osborne, in asserting that an independent Scotland wouldn’t be able to use the British pound, Osborne couldn’t credibly assume the leadership, either. Both would be discredited by the failure to win the referendum. Who would replace Cameron, then? There’s no shortage of figures. London mayor Boris Johnson, who is already running for a seat in the House of Commons in 2015 with an eye on the future leadership, would be the initial favorite — if not as prime minister immediately, then as Conservative leader in the next election. If the Tories believe Johnson is still too outlandish or inexperienced, they could turn to Theresa May, who has served as home secretary since 2010 (and who is more eurosceptic than Cameron), or even Jeremy Hunt, the health secretary since 2012, could succeed Cameron. Another option is William Hague, until July 2014 the UK’s foreign secretary, a former Conservative Party leader himself from 1997 to 2001, and now a seasoned statesman. What’s more, it wouldn’t take much to trigger a leadership vote. Just 15% of the Tory caucus — around 46 members of the House of Commons — would have to request a vote from the 1922 Committee. Thereupon, any number of candidates might emerge to challenge Cameron. But Scottish independence wouldn’t just destabilize the Conservatives or the Cameron government. 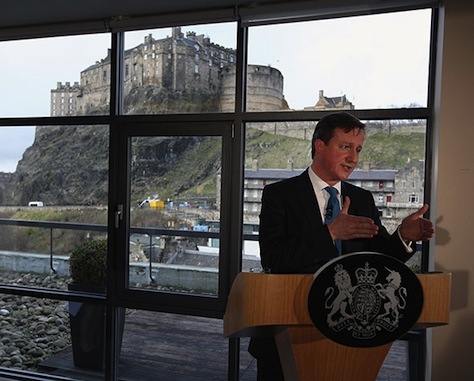 Scottish independence would take effect in 2016, so there’s some question about the process of the next election. Though Cameron’s government instituted fixed-date elections at the urging of deputy prime minister and Liberal Democrat leader Nick Clegg, it’s unclear what would happen in 2015. Consider if, for example, Scotland’s 59 MPs are enough to turn the tide in favor of a Labour government in the House of Commons. What happens if Labour has a narrow majority with its Scottish Labour MPs, but not without them? Would Labour leader Ed Miliband automatically become a lame-duck prime minister next May 8? Would the Tories then take power in 2016 for four years, or would the rest of the United Kingdom hold new elections without Scotland? Until this week, it’s likely that no one in Westminster thought that the ‘Yes’ campaign would stand such a serious chance. But if Scotland opts for independence, it could shake English and UK politics to its core — in ways that transcend whether David Cameron will keep his job. Photo credit to Jeff J Mitchell/Getty Images.